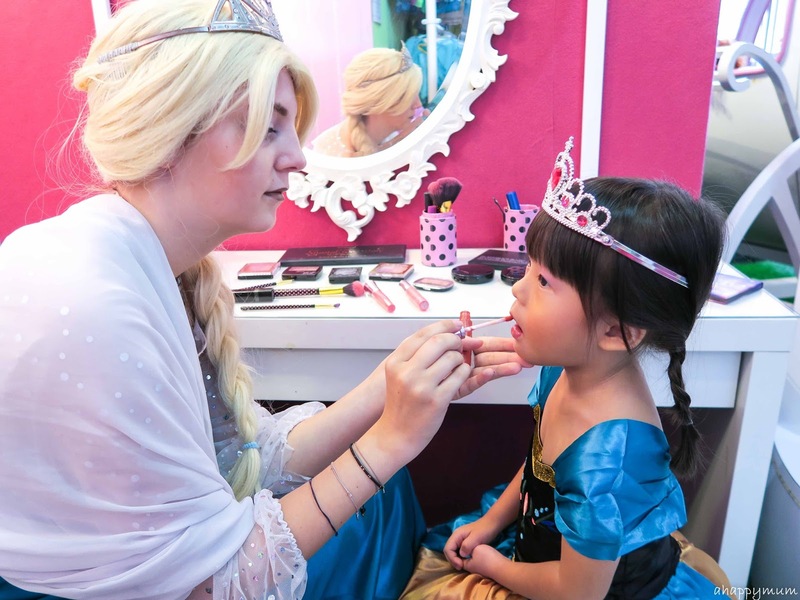 My girls are in love with princesses. 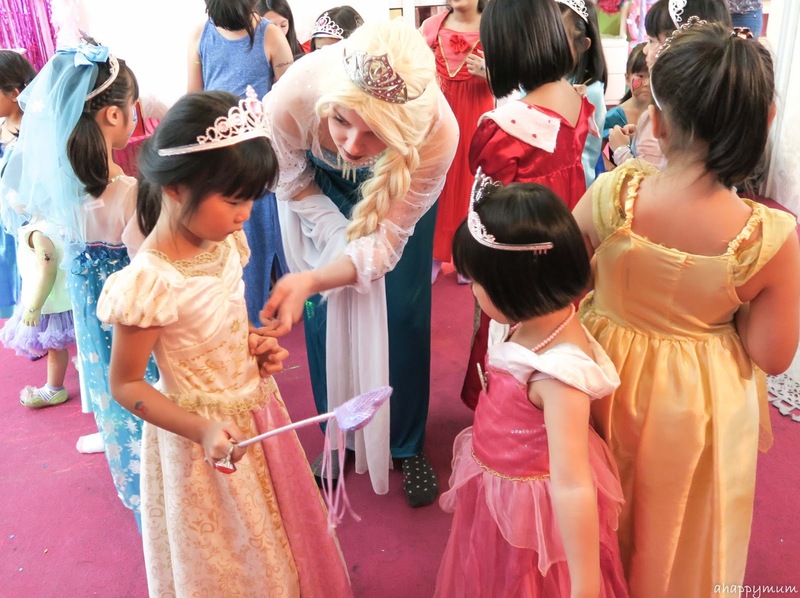 They like to dress up as princesses, listen to princess stories and pretend that they are real princesses. 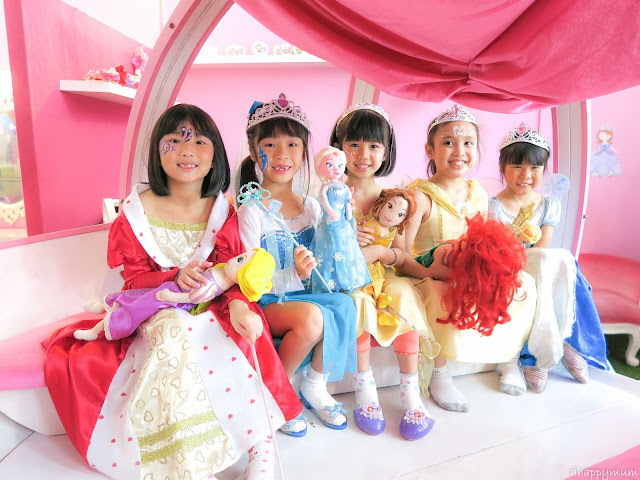 While they also have a sporty, gutsy side to them, this girlish and feminine side speaks to me in volumes and judging by how fast they are growing up, I think we won't have too many years left before they outgrow this phase. Or, will we? Anyway, while they are still very much fascinated and in love with all things to do with princesses, it is the perfect time to hold a princess themed birthday party for them this year. 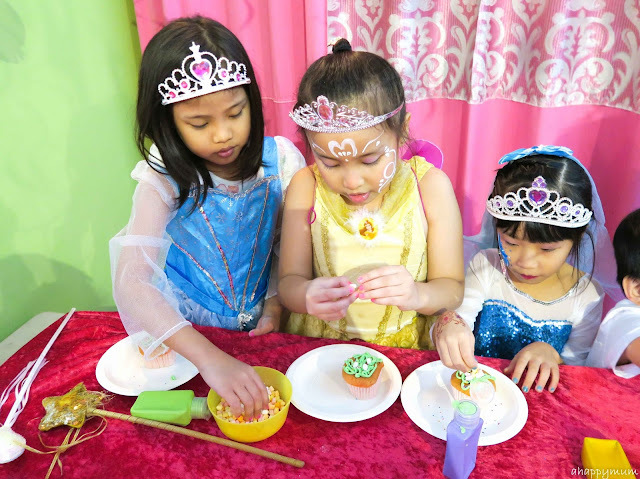 Since we are all very busy with the move and the house is in a total chaos, I was very ecstatic when we knew that we could host our party at The Tiara Society - the magical kingdom for little girls with royal aspirations. 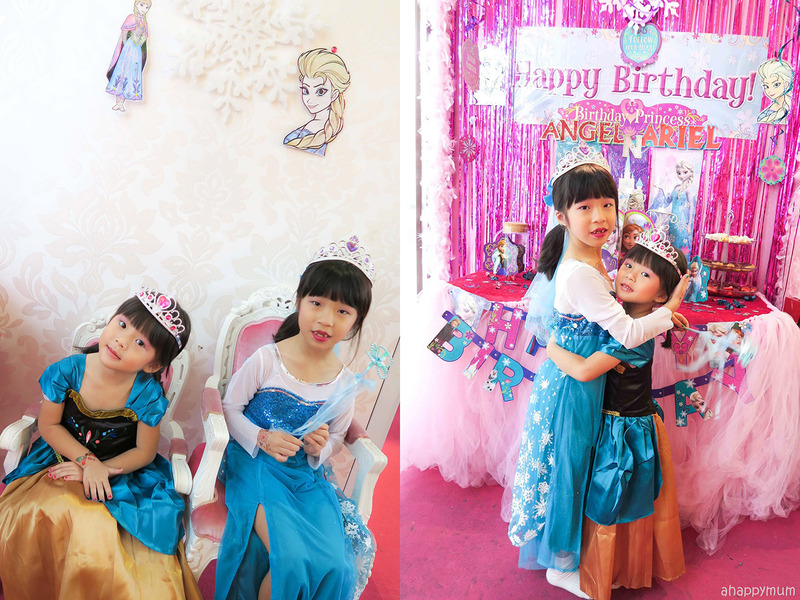 It was the perfect choice for my princesses and it helped to make their dreams come true - even if it was only for a day. 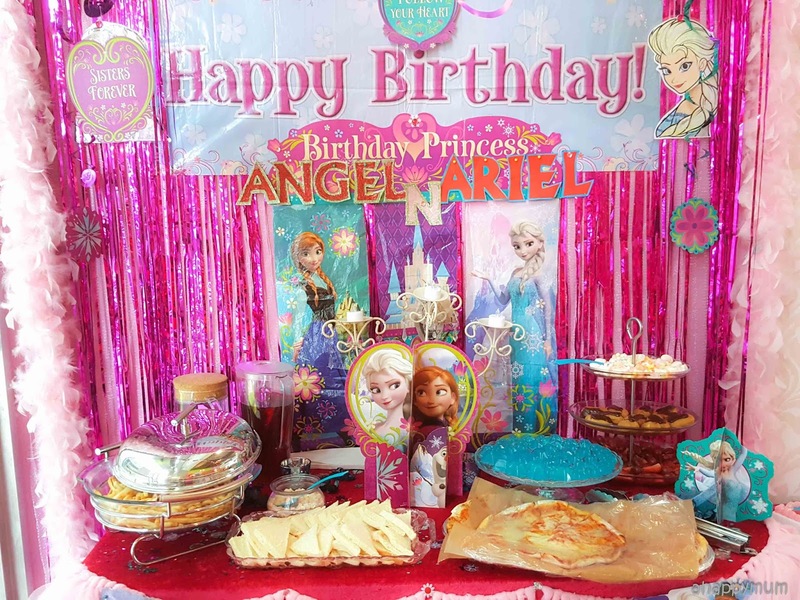 In this post, let me share with you all about the Royal Princess Party we had to celebrate Angel turning 7 and Ariel turning 4. 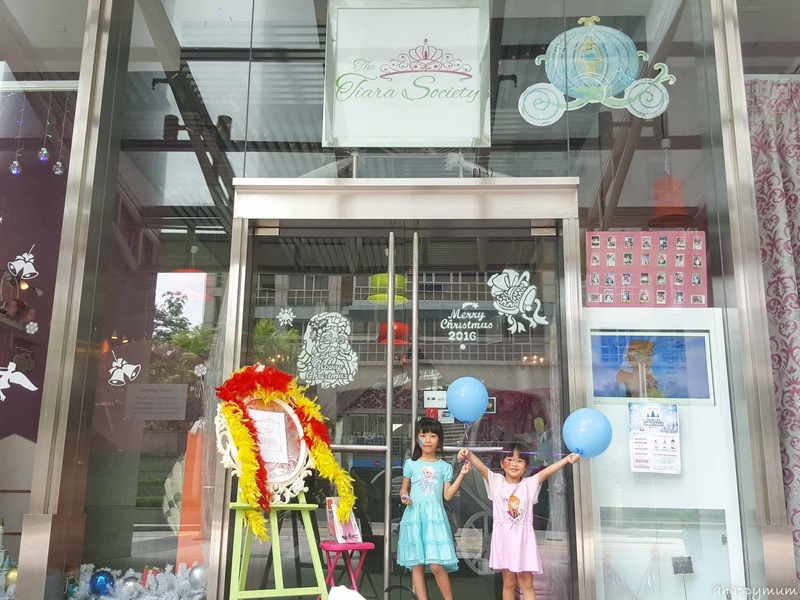 Located in UE Square near Robertson Quay, The Tiara Society is nothing like what it looks like from outside. I remember that the first time we came here, it was by chance after we had an audition for a commercial in a studio right across the road. 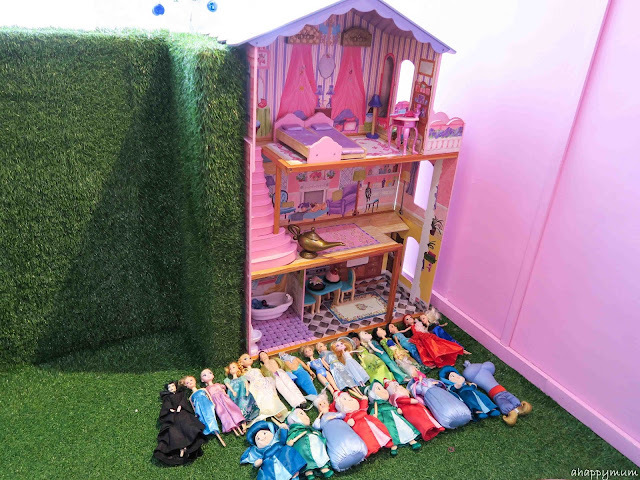 The girls were thrilled to stumble upon this whimiscal, imaginative and fun-filled place which is something different from the usual indoor playgrounds that they visit. Remember the party invites that we did ourselves? We invited a total of 15 guests (all girls!) for the party which I felt was a nice number for an intimate group so I could make sure that everyone could indulge and have fun. The girls chose most of the guests themselves because I want them to be able to celebrate this day with the people who matter to them now. 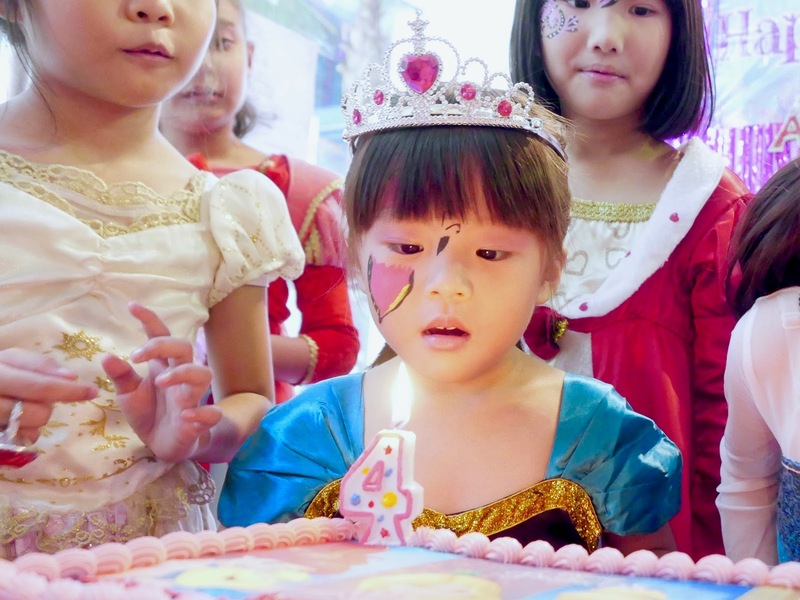 For the first time in a long while, it felt a little weird that I could relax and leave the party planning to others because I was so used to doing it all these years. 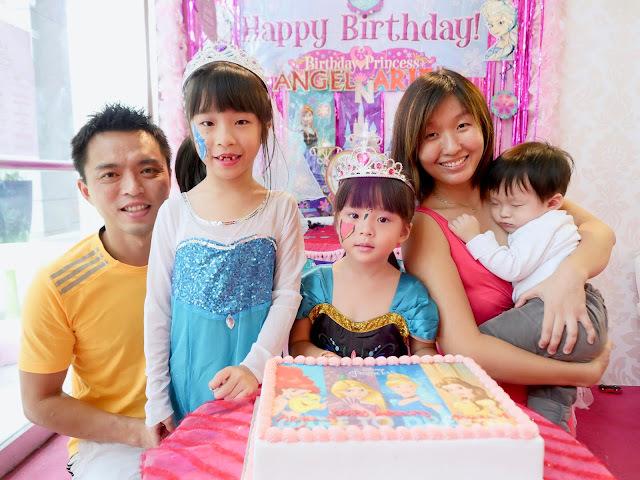 Nonetheless, I still wanted to play an active role on my kids' special day and all of us were eagerly looking forward to the activities which had been lined up for us. Right at the entrance, there was a welcome poster for the guests which stated the outline of the program for that day. From princess games, dress up and dancing to story telling and the royal banquet, it sounded splendid for a 2.5-hours party - which to me was the right duration for a party, neither too fleeting nor too lengthy. 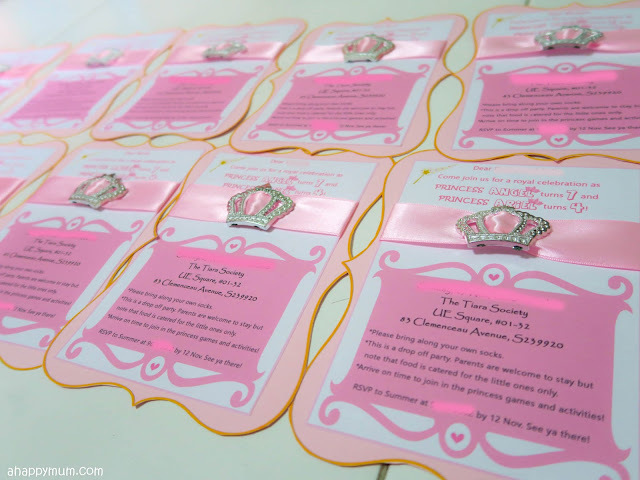 Are you ready to let us bring you on a tour inside The Tiara Society and tell you more about the activities we did? Let's go!! 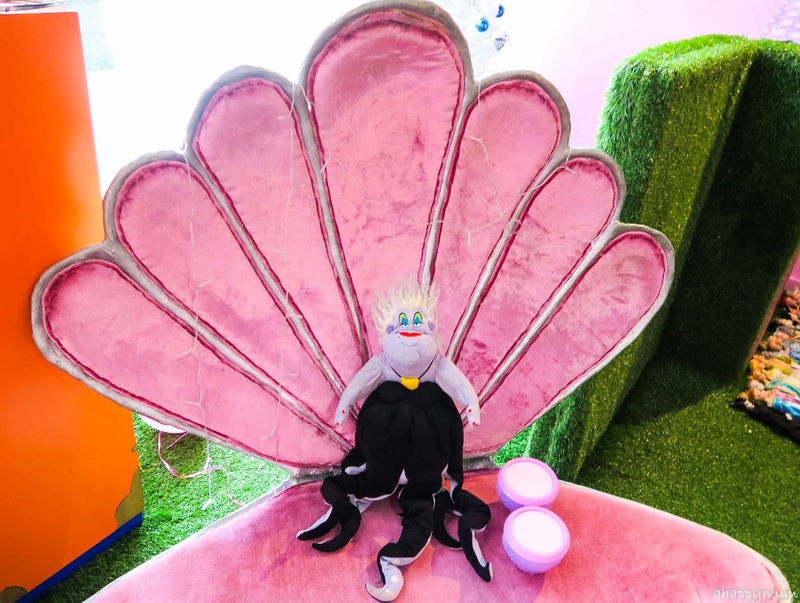 Once you enter, you will greeted by this giant oyster with Ursula sitting on top of it. I thought it made a good backdrop for photo taking too, even if you are not the Little Mermaid! 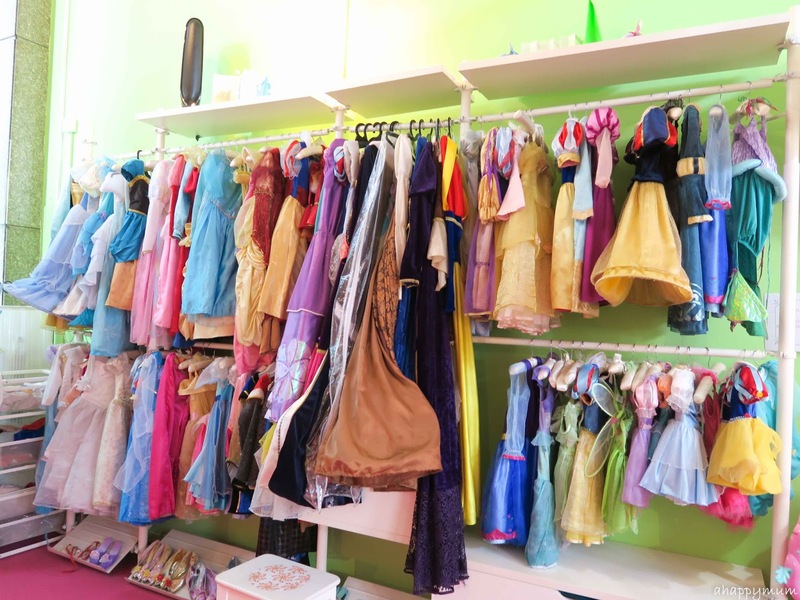 You can also find a selection of tiaras and wands on top of the shoe cabinets and the children can feel free to choose and put on whichever they like. 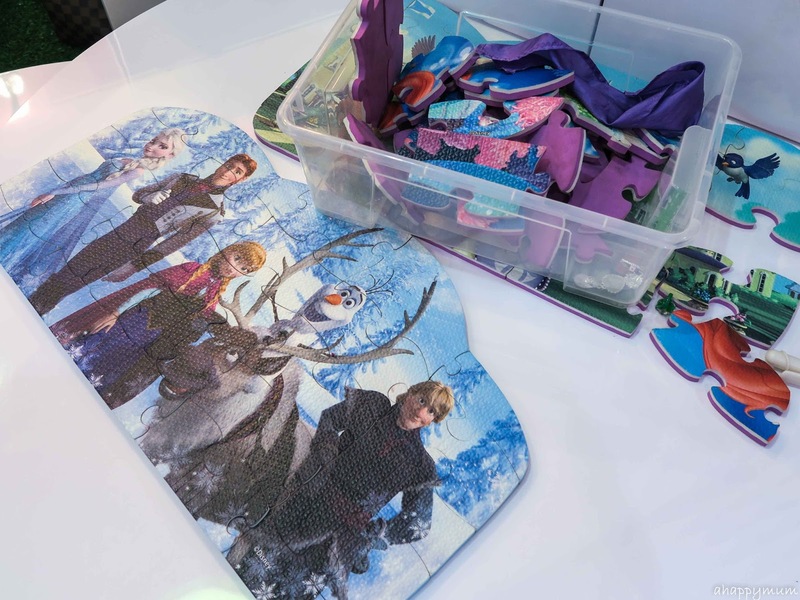 Yes, talking about shoes, note that all adults and kids will need to wear socks when in the premises and you can either bring your own or purchase when you are here. Shoes also need to be removed before you can enter the princess chambers. Most of the props and toys that you see in The Tiara Society are handpicked and made with superior quality, with an emphasis on wooden toys. With the pink walls, pom poms, plush toys and princess-y ornaments, everything worked together to create this feel of a dreamy fantasy land. In the Tea Party Chamber, princesses can pamper themselves and sit down to have a pretend cup of tea or tuck into some pastry delights. For girls who love dolls, they will love to get creative with the array of beautiful dolls and multi-tiered dollhouse in The Dollhouse Chamber. In the Wardrobe and Dress up Chamber, girls can transform into their favourite princesses and take their pick from the racks of princess gowns, shoes and accessories. From what we saw, each gown comes in limited sizes so you might not be able to always find the right size. However, there are so many gowns available so you should be able to at least find one, or in fact a few, that fit nicely. 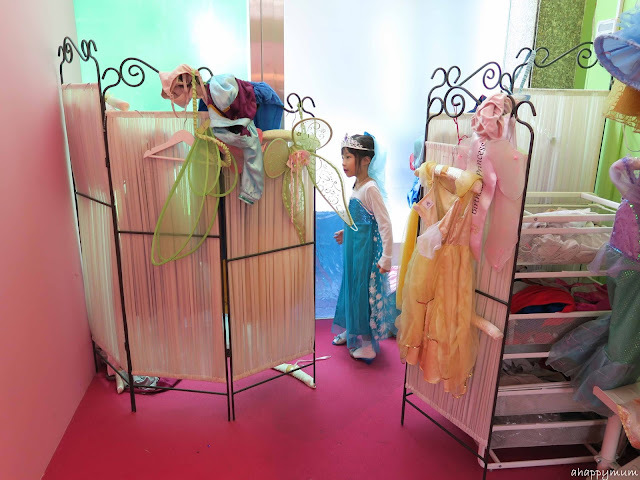 Our guests range one year old to eight years old and all of them managed to find dresses which suited them perfectly. Just so you know, the Tiara Society caters to little girls aged from 0 to 10. So, like I said, it's only a matter of a couple of years before my big girl gets, well, too big so I'm glad we did this! 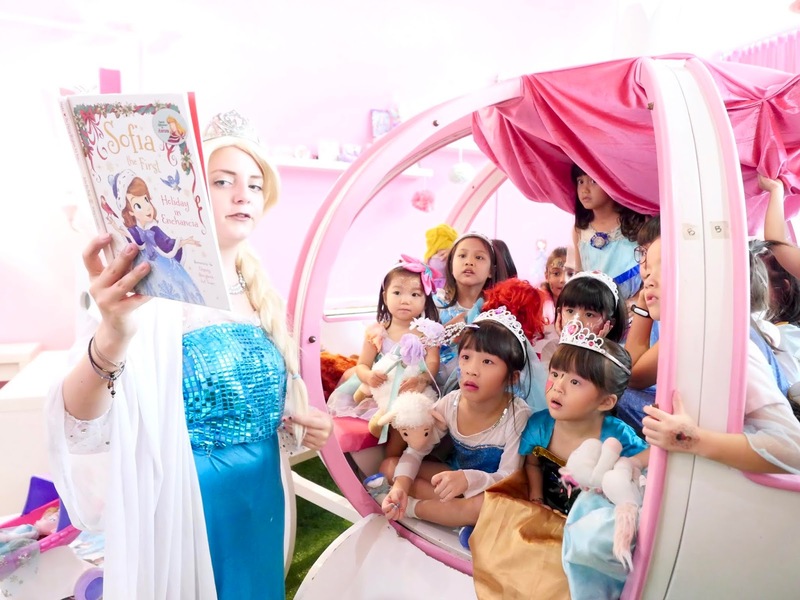 There is also a Reading Chamber for princesses who love to pick a book to read or have a moment of peace. Our favourite chamber of all has to be the Outdoor Gardens because this is where you can find.... a real princess carriage! 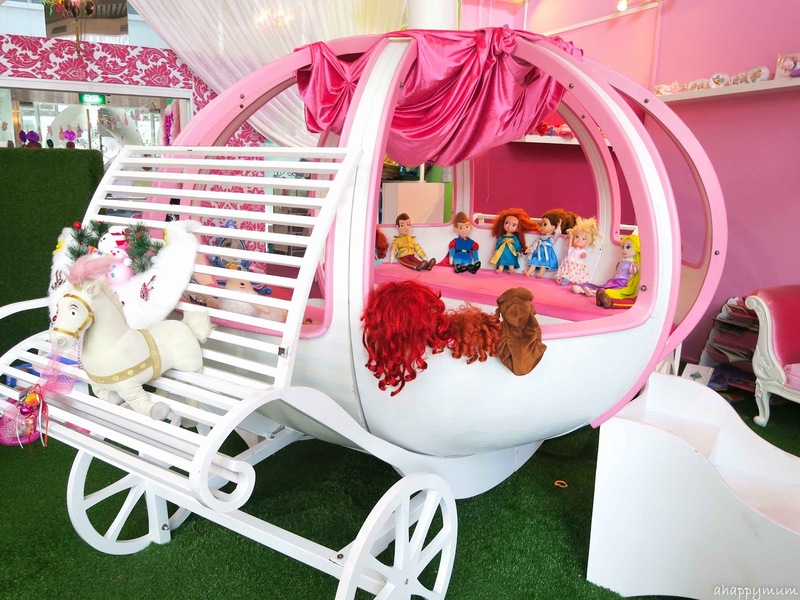 Yes, it's a life size, pink and white carriage that can accommodate the princesses and even comes with a slide. 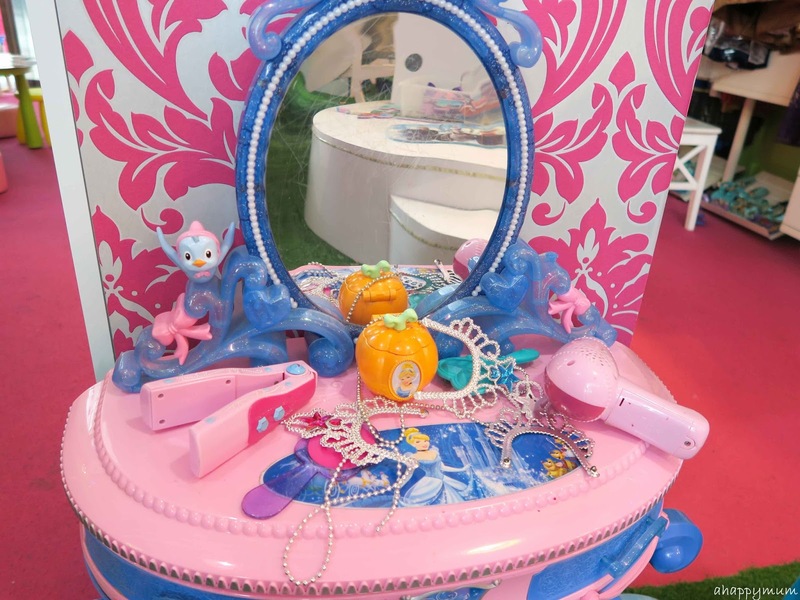 I can imagine the hours of fun my girls can have in this carriage, be it chatting, playing with dolls, reading books or just imagining how it feels like to be Cinderella. So, does that mean this place is out of bounds to boys? Well, no! 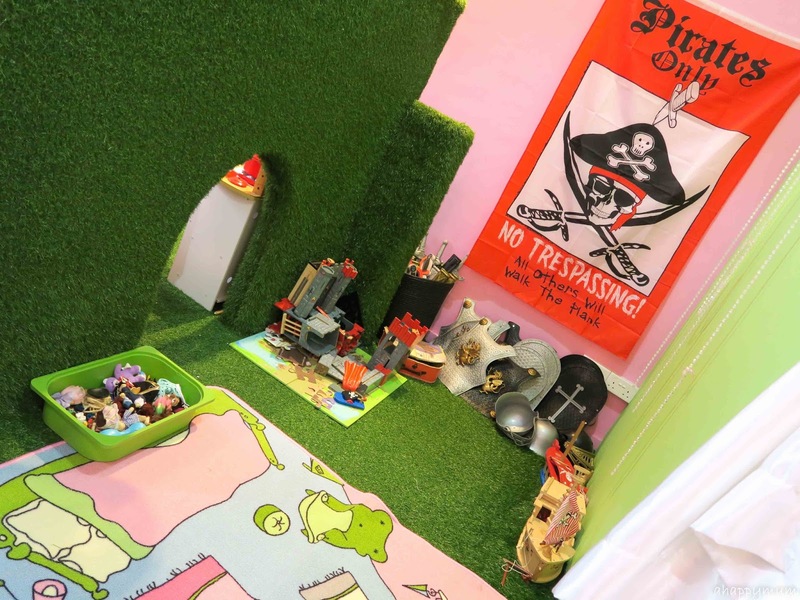 Although I don't think that boys will enjoy the experience as much since the activities are catered for girls, there is a Knights Chamber where they can play with swords, shields and medieval castles. There are also costumes for boys in the wardrobe but let's just say you don't get much of a choice. Now, let me tell you more about our royal celebration! 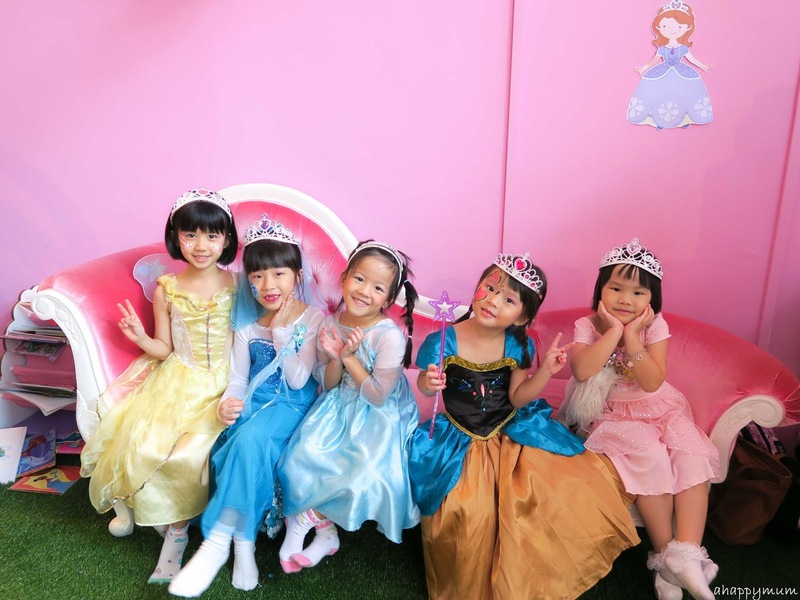 When I was asked what princesses the girls would like to be on their special day, I kind of said "Anything, as long as you can find dresses that fit" because I thought that the girls would be happy in any case. Then, after discussion with the organisers at The Tiara Society, we eventually decided on a theme which was absolutely perfect. 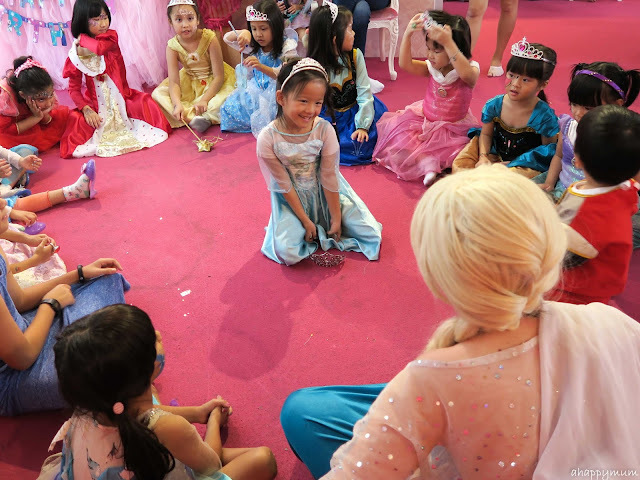 Think - Princesses, Disney, Sisters. Well, I think you know by now, right? 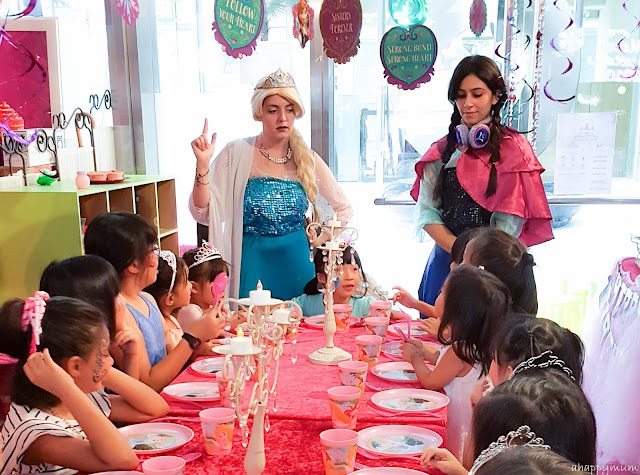 Yes, we opted for a Frozen theme and my girls were just over the moon to know that they were going to be Elsa and Anna on their special day. It is still one of our favourite Disney movies of all time and I personally love the show because it shows the meaning of true love and how sisters can be best friends for life. The first thing we did when we arrived was to let the girls go for a.... makeover! Check this out, the big girl was being transformed into Elsa by who else by Queen Elsa herself! Yes, we were pleasantly surprised to see that we had Elsa, followed by Anna, who would be our emcees and game masters for the day. 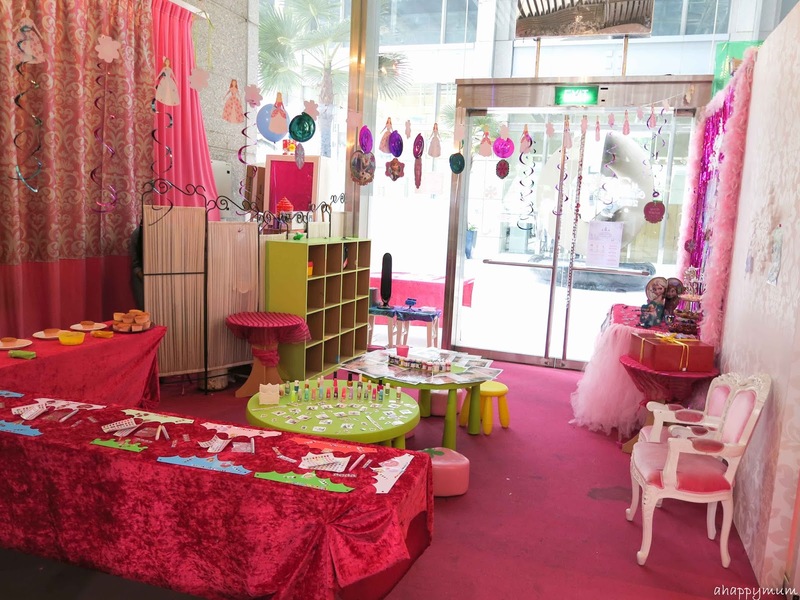 How wonderful for the kids! Here was the big sister after her transformation. She looked cool as the Ice Queen, she chose all her accessories and makeup colours and she enjoyed every bit of the dolling up process. 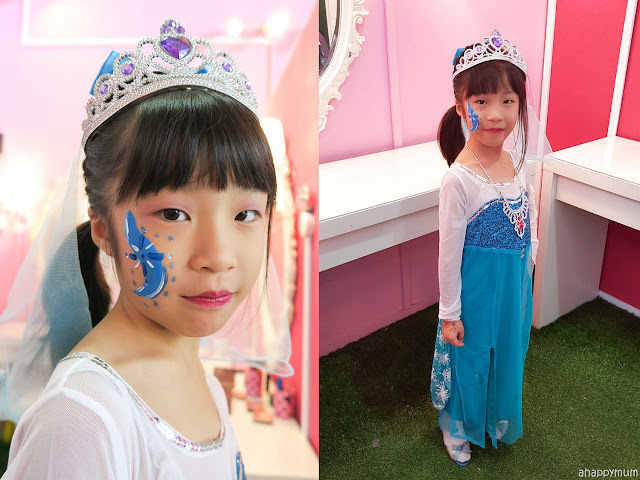 I know, I could tell from her look that she was relishing the whole experience because Mummy seldom lets her do girlish things like this. And now for the little sister! The first time I saw the dress, I was certain that it was too long for her and she was going to constantly step on it when she walked. Who knew it fitted her to a tee (yes, tell me about it, they grow up just too fast) when she put it on and I thought it made her look so gorgeous too. I personally love Anna a lot and I think that her positive, vivacious demeanour suits Ariel well too! Woohoo, we were all set for our guests to arrive! 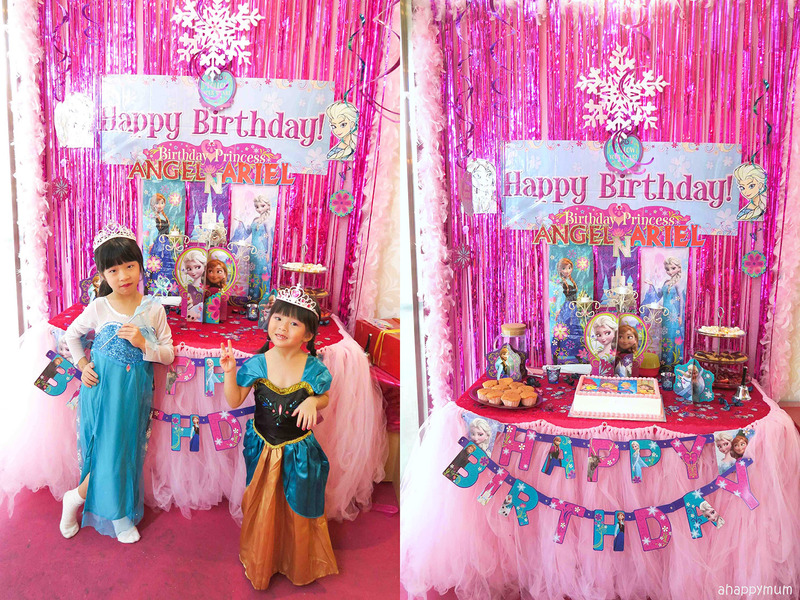 See this beautiful, personalised Frozen themed dessert table that was set up for us by The Tiara Society? I love it so much and I thought the colours worked very well and the vibrant hues of pink and purple looked so inviting and created a joyous atmosphere too. 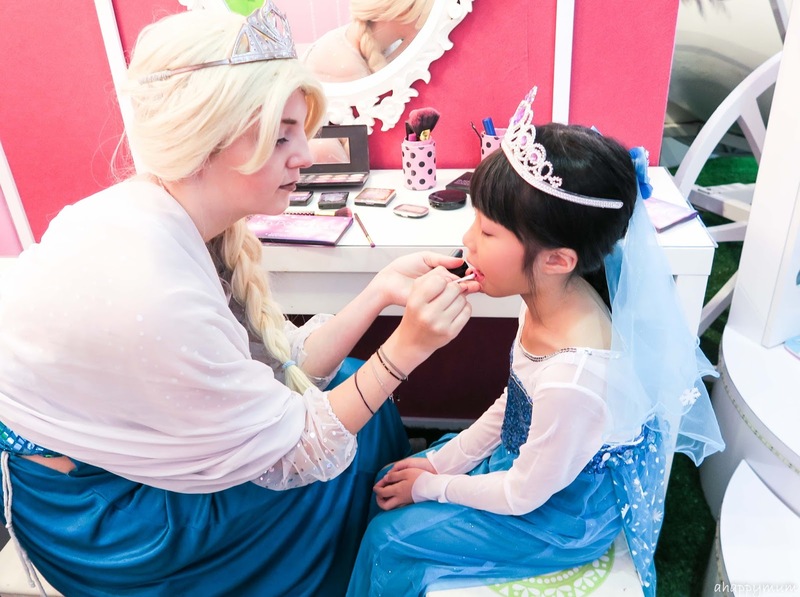 Now, what can the guests look forward to besides being able to dress up in princess costumes? 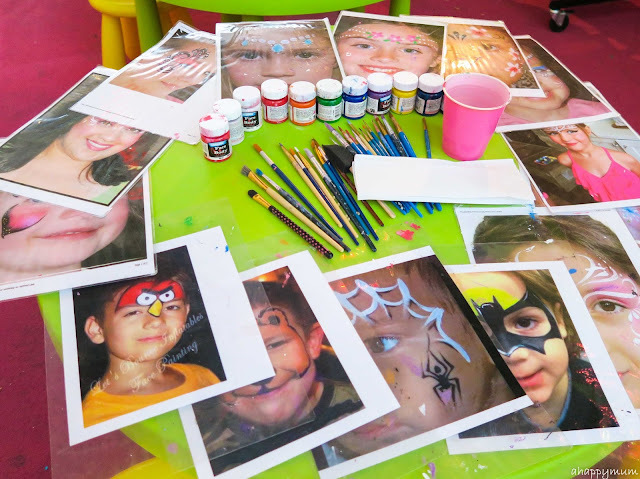 We'll show you one by one the activities that we did at the party! 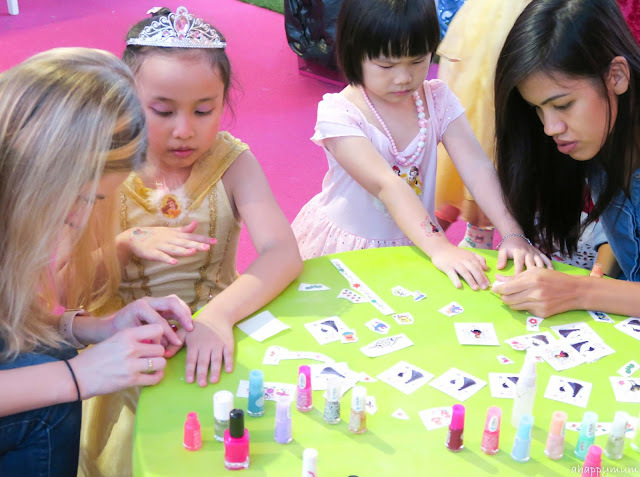 Sit back and relax while you get your nails painted in your favourite colour. Fancy a tattoo? 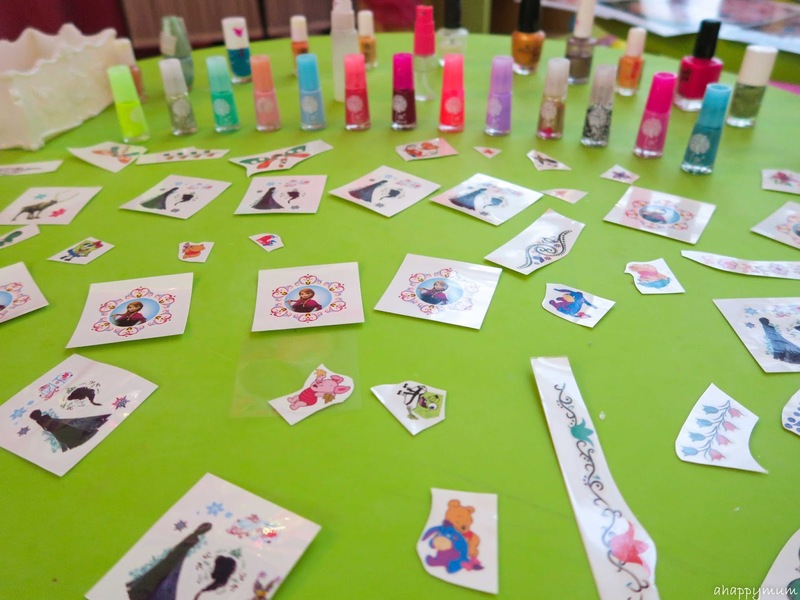 Choose from a selection of cute, stick on tattooes to add on your arm, back of your palm or even your face. 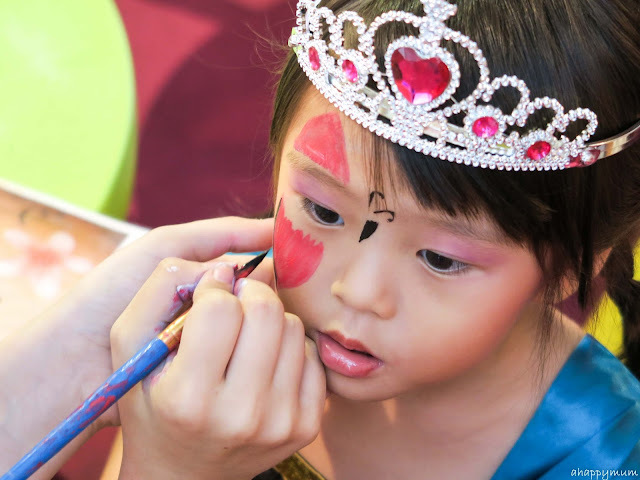 If your kids love face painting like mine do, then they will be in for a treat at the party. 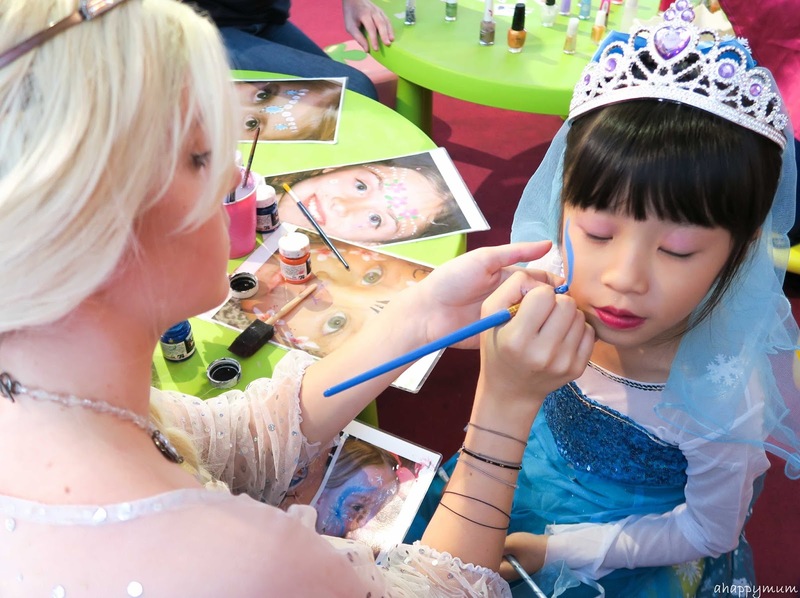 The girls got painted by Queen Elsa herself and that definitely makes it very memorable! I like my parties to have some craft activities so I was glad to see that the princesses got to decorate their own paper tiaras. 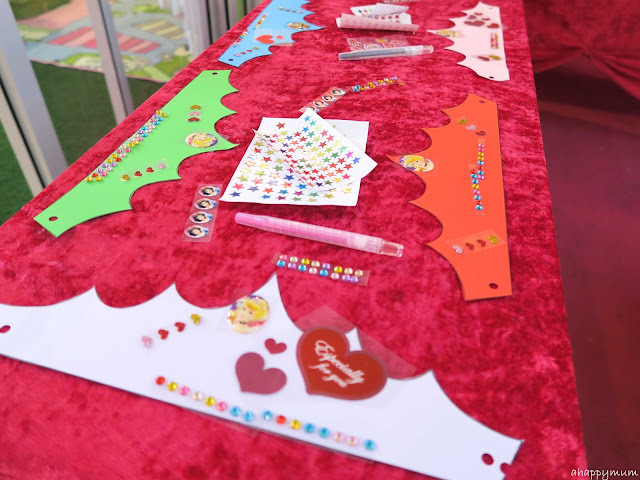 They could choose from many different types of stickers or use the markers provided to write their own names or design their own patterns too. 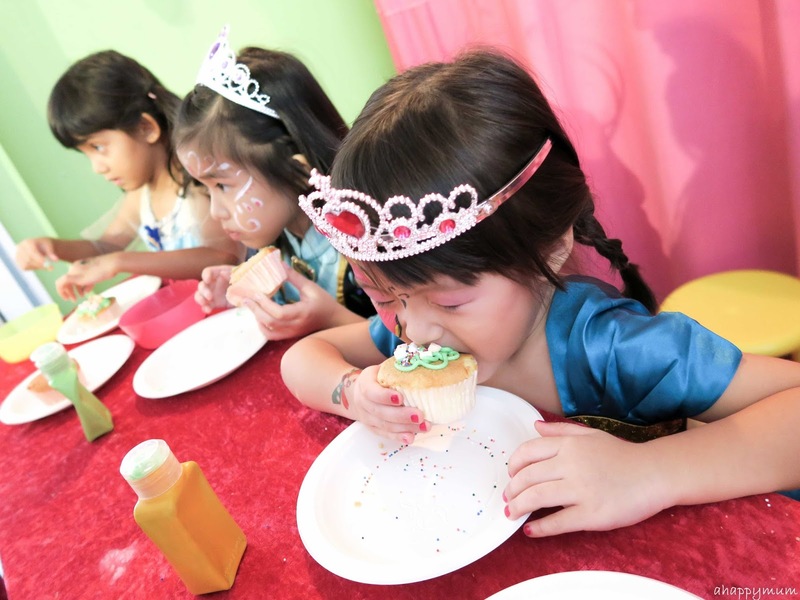 The princesses were also tasked to decorate their own cupcakes with icing and rainbow sprinkles and when it was all done, they could eat it! Now, if there is something I don't like so much about the place, it's that there is no toilet inside the premises and you have to walk a distance to get to the toilets located in the mall. This makes it a little challenging when the kids are handling food or need to pee urgently. Now, which kids doesn't love to play games at a party? We played a game of Princess Freeze which had the little ones dancing away to the music and coming to a still when it stopped. 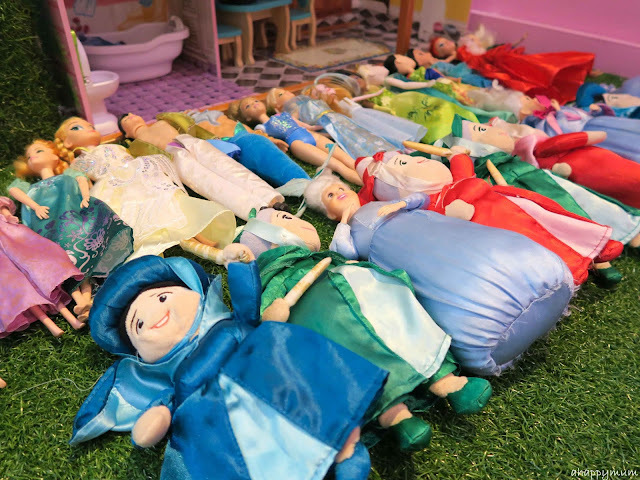 Yes, it was kind of like a mannequin challenge, princess style. 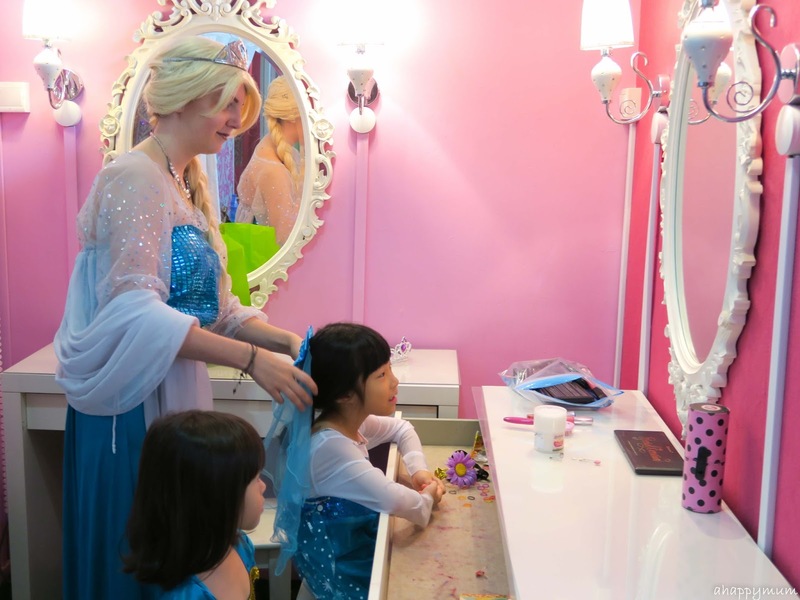 The tricky part is that Elsa and Anna will go around tickling you and once you move, you are out of the game. 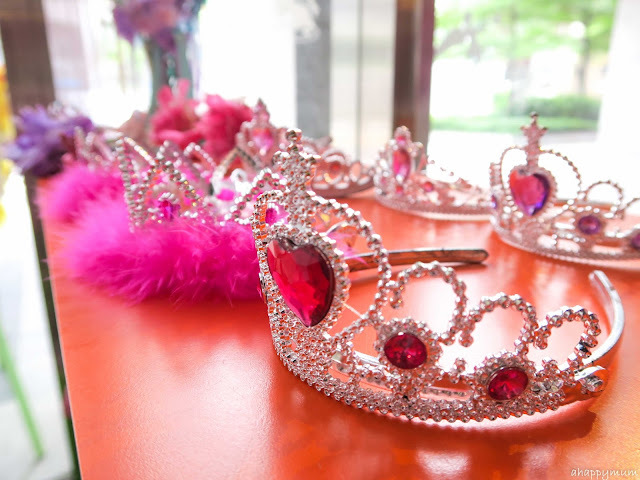 The second game was passing the tiara in a circle and if it lands on you when the music stops, you will move to the middle and either sing, dance or tell a joke. Seriously, I was amazed by how many of the kids chose to tell a joke. For example, what starts with T, ends with T and is full of T? The answer is Teapot. Get it? It was only at the final round when Angel and her friend got up to sing to "Let it Go" and that was a great way to end the games. My girls love stories so you bet they were very happy when Queen Elsa announced that she would be telling them a story..... and asked them all to get into the pretty princess carriage. 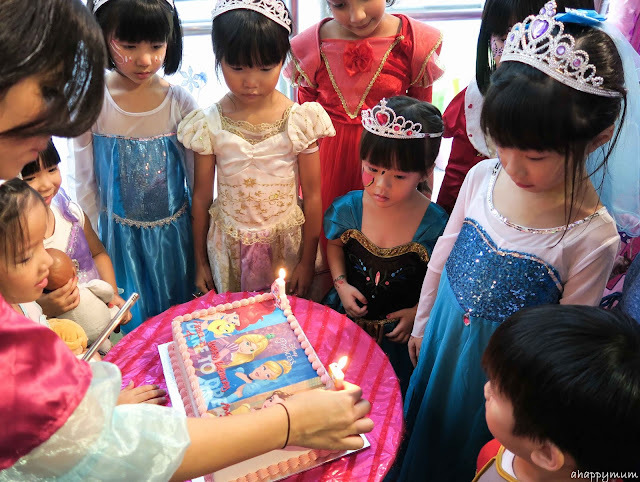 See, they were so engrossed in the story which talks about the adventures of Princess Sofia - who was our birthday theme for last year. 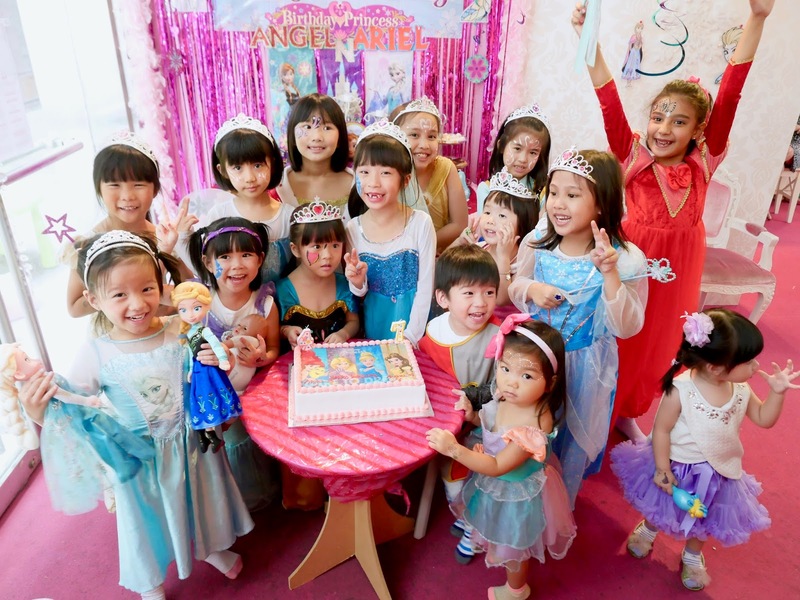 After all the fun-filled activities, it was time for the Royal Banquet to commence! Yes, the kids were too happy to be able to tuck in and they were treated to a lunch that comprised of pizza, sandwiches, fries, eclairs, jelly, marshmallows and fruits. The best part was that they got served by Elsa and Anna who kept them delighted and kept them full. No, I'm kidding, of course. The best part was that the girls got to sit down with their best friends and simply enjoy the company and appreciate this thing called friendship. As for the last highlight of the day, it's the cake cutting ceremony, of course! 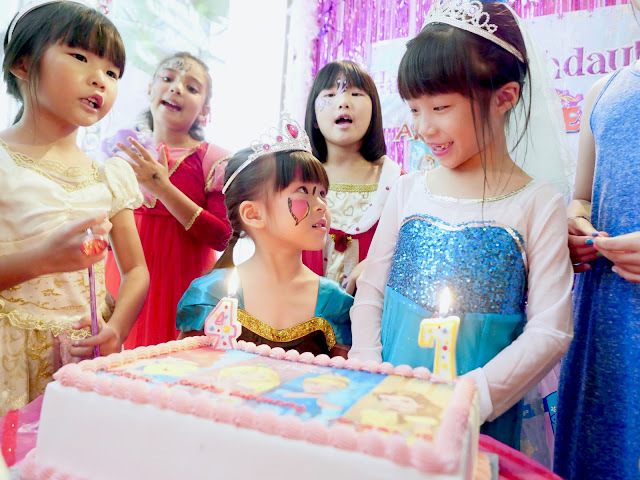 We got this 2kg Princess cake from Bengawan Solo (which cost me $90) in chocolate crunch flavour and all of us loved it lots! 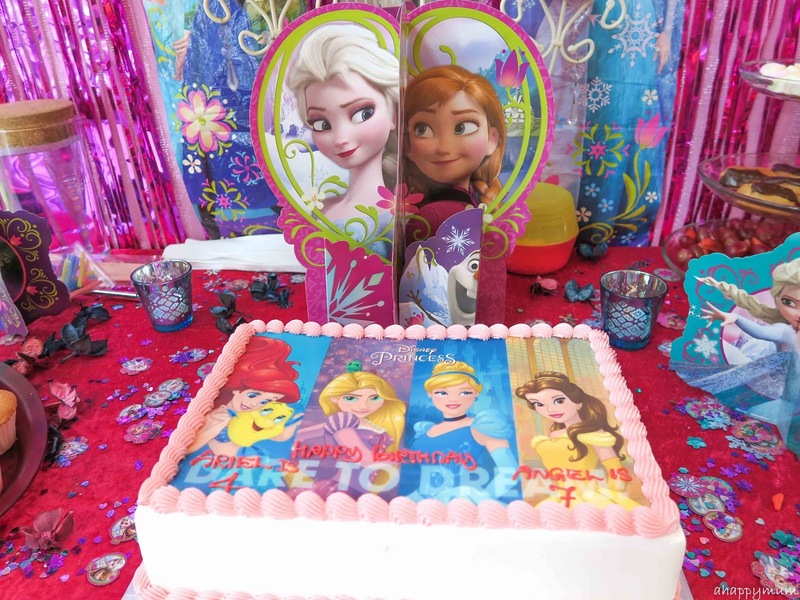 The big sister is currently in love with Belle and the little sister is still a fan of Little Mermaid, so this cake suited their Princess Party to the max, didn't it? 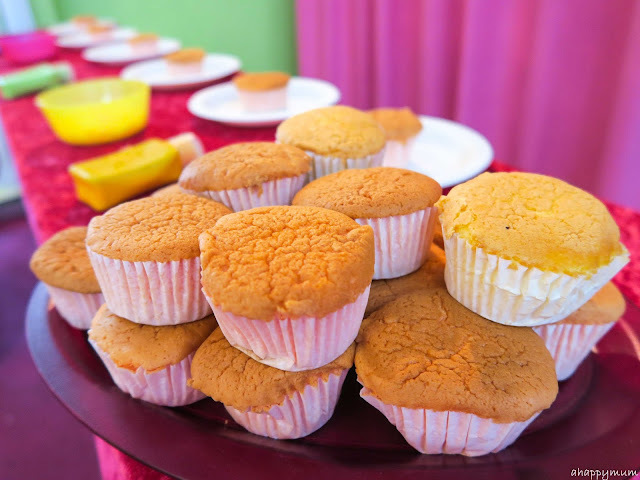 Do note that there is no fridge in The Tiara Society for cake storage purposes but the cakes usually turn out well since it is air-conditioned and the party doesn't last too long. So, what happened was my camera died on me by this time because I was trying to take so many videos of the girls to include in their growing up videos in future. Thankfully, May from A Million Little Echoes kindly helped us to capture some precious shots below and I am just so grateful to have friends who care (and friends who can take nice photos)! Here are some pictures from the cake cutting ceremony! Time for a group shot! Can you see the drastic height difference between the tallest girl and the shortest one on the right hand side? 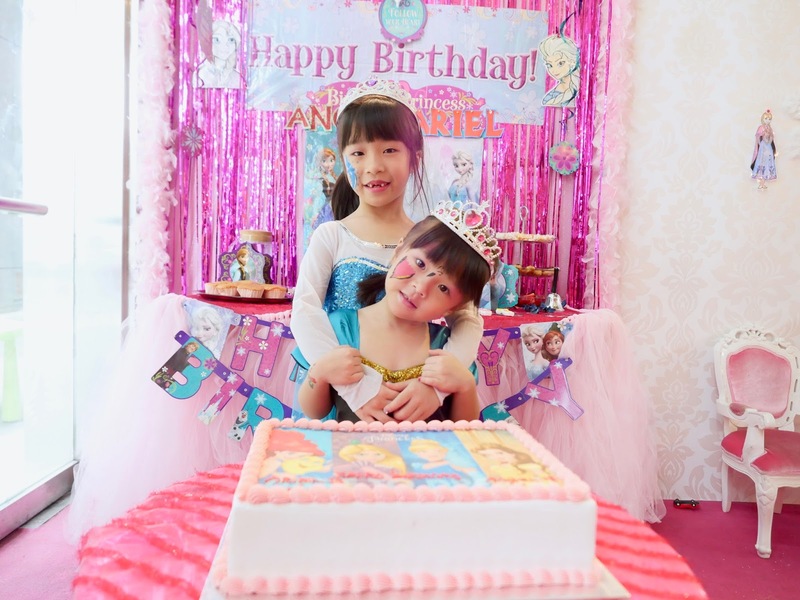 The thing is, we were told by their parents that they both enjoyed the party very much! I love this spontaneous shot which tugged at my heartstrings and spoke volumes to me about the love the girls have for each other. Yup, these two somehow looked at each other when the birthday song was being sung and it was time for them to make their birthday wishes. I so hope, so very hope, that the two of you will always love, take care of and look out for each other, from now till when you both grow old, okay my dears? 1, 2, 3, blow! May all your wishes come true! I was stoked when Angel turned to me and said "Best day ever!" and so I concluded that one of her dreams already came true at this fabulous princess party. As for Ariel, she said she was just so happy to be able to celebrate her special day with her friends and told me "Thank you, Mummy". Awwww. 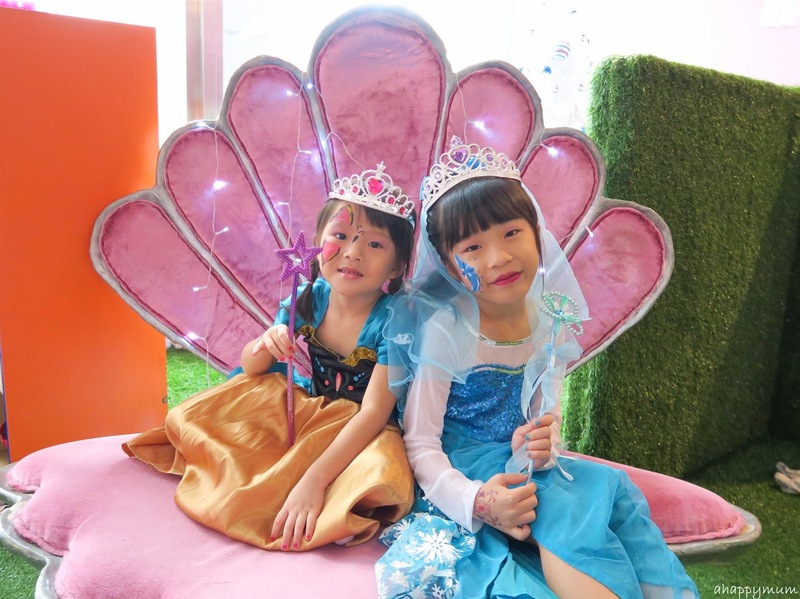 A big thank you to The Tiara Society for making our princesses, and all of their friends, so happy on this special day. 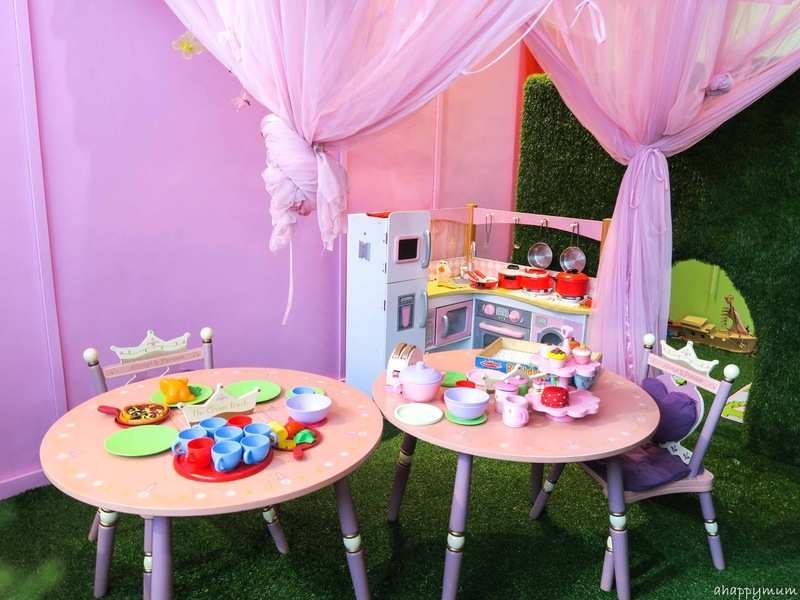 This merry royal celebration will definitely be a party to remember. 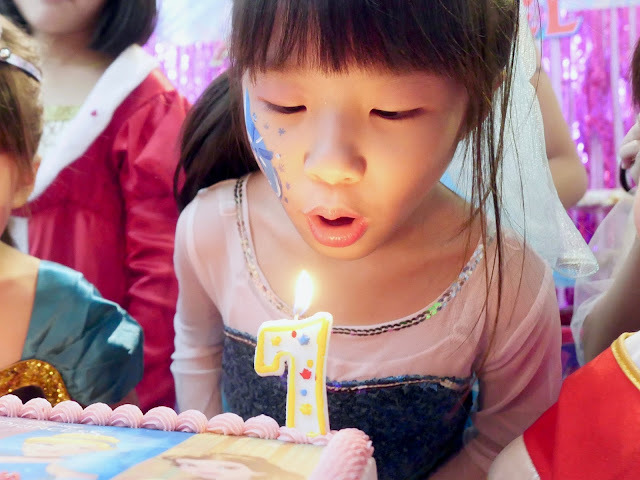 To my dear Angel and Ariel, happy turning 7 and 4! May love, happiness and good health be with you always. We love you so much! To find out more about their party packages, go here. 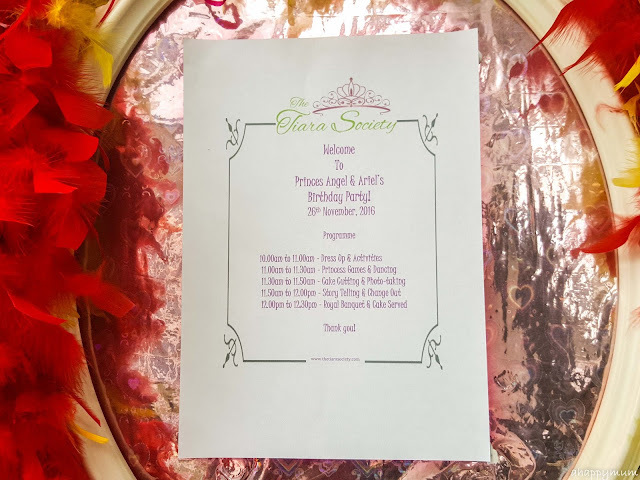 For more information, visit http://thetiarasociety.com. Disclosure: This is a sponsored review of The Tiara Society. We received a complimentary party package for Angel and Ariel's birthday in return for writing this post. All opinions are purely our own. I am already missing the party. Thank you so much for the invitation. Look at those dolls! All lined up neatly in a corner. 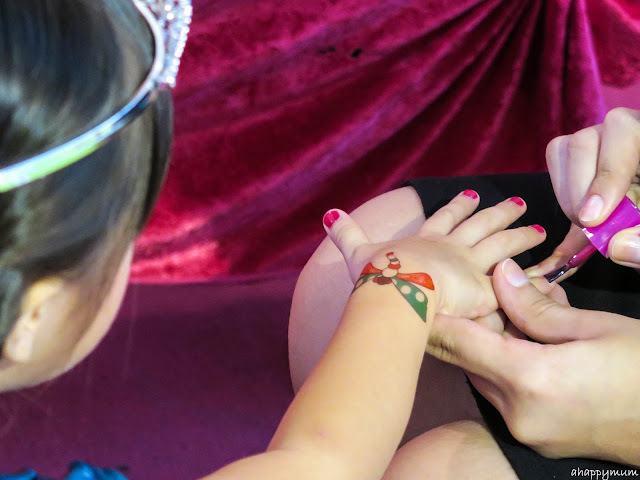 When we left, the girls turned the Tiara Society upside down! hahah which also meant they were happy like crazy too! Happy birthday girls! 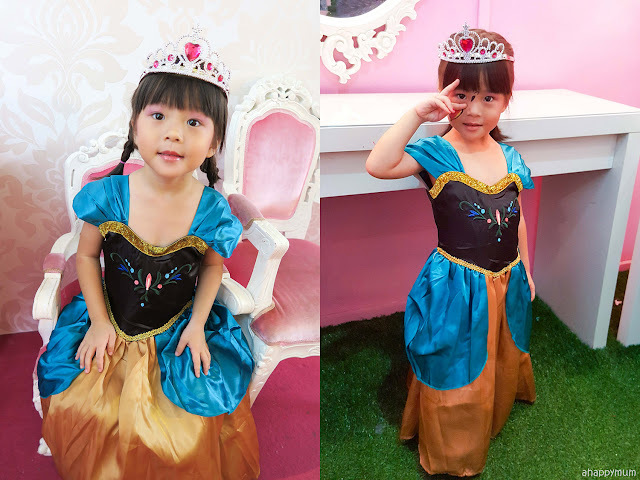 Both are looking so cute and they are really princess. Nice cake and stunning decoration. I liked the invitation card also as you have posted here. Our entire team of writers who provide guidance to students on hrm dissertation topics, wishes belated happy birthday to both lovely girls. Enjoyed to see all the pictures posted here. Wow! It must have cost a bomb to host such a party. 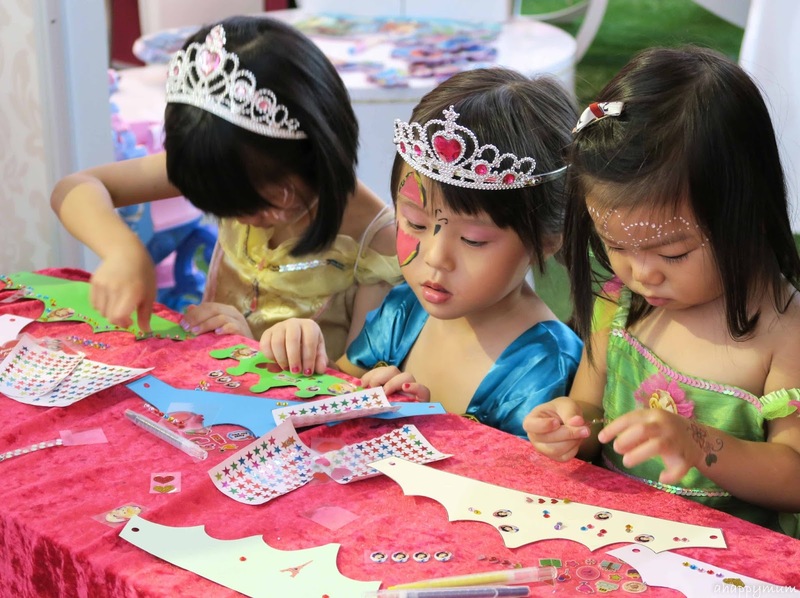 Lovely tiaras, carriage and adorable girls.